Buffet Dining - Las Vegas Visitor- insider reviews of restaurants, casinos, attractions, and online shopping for Vegas collectibles and gifts. We only list those restaurants that would be of interest to a Las Vegas Visitor. The bulk of those restaurants are on the Strip itself. We have listed a few that are in Downtown or in more outlying areas or are farther away from the Strip. For example: the "M", Red Rock, Rio, Palms, etc. There are hundreds of dining establishments in Las Vegas and to me it does not make sense to list them all, a tourist would not visit there anyway. We have listed them by type of cuisine, rather than by price. Most restaurants on the Strip are good to excellent, a few are four star.If you wish to leave your comments about them we will install a comments area on the front page for all to see. Remember, as always, you get what you pay for. The Heart Attack Grill When they say heart attack grill, they mean it. I have heard of two of them in that restaurant. There may be more we haven't heard about.yet. One of their offerings is a milkshake made out of butter, a buttershake so to speak. The wait staff is dressed in nurses uniforms and carry first aid kits. Anyone over 350 pounds eats for free.They offer a hamburger so large they actually offer to pay for it if you can it it all. And so it goes. The attached picture speaks for itself. 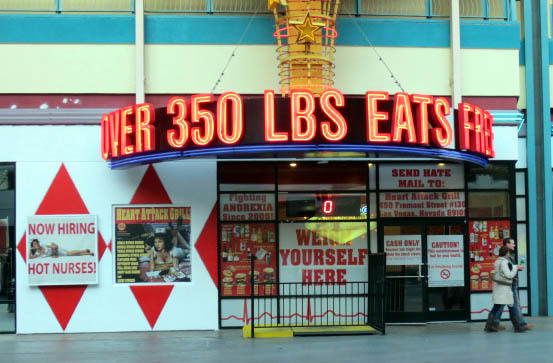 If you want to give it a shot, you can find it in downtown Vegas on Fremont street, in the pedestrian zone. I haven't been in that place in several months but the last time I checked it it was very good. I had one of their baked potatoes, a spud so large I couldn't finish it. The ambiance is great too. A little bit pricey, especially when it comes to dinners. The menu features steaks, seafood and salads. at the Aria Hotel, 3730 Las Vegas Bl. S.
Regular American coffee shop fare. This purportedly is the largest coffee shop on the strip. Open 24/7, just like all other cafes that are inside a casino here in Las Vegas. Luxor, 3900 Las Vegas Bl. S. 877 386 4658. Another excellent restaurant BUILDING at the Hughes Center (see Cozymel's) - like an old corrugated aircraft hanger in the tropics, overgrown with vegetation, palm trees inside, a water feature, and an outdoor patio where I am waiting for the right season to go to and have a few. Actually, the food is pretty good too. There's some "jerk" this and "Cuban" that on the menu, but it is all Americanized to me, so don't worry about being challenged. Oh, don't forget the pizzas. Count on a big variety of appetizers, salads, sandwiches, and meat dishes. Add some fancy tropical drinks and about 50 beers to choose from, and you'll find something you like no matter what. Sidewalk Cafe, 3645 Las Vegas Bl. S. 877-603-4390 (hotel), 6AM - 2PM. Casual dining, coffee shop style, relatively inexpensive, $12. and up. 702 862 5138 (restaurants). Tropicana, 3801 Las Vegas Bl. S. 702 739 2222. Open 24/7, Res. 800 462 8767. Rio, 3700 W Flamingo Rd Las Vegas, NV (866) 746-7671. 24/7. (866) 746-7671. Venetian, 3555 Las Vegas Bl.S. 702 414 1000. Mandalay Bay, 3950 Las Vegas Bl. S. 702 632 7777. in the walkway connecting Mandalay Bay and the Luxor. Upscale burger joint with upscale pricing. A veggie burger and a beer set me back $12, tip not included. Unfortunately, if you are hungry there are no choices that are less expensive. Sun. - Thu. 11 - 11, Fri. Sat. 11Am - 1AM. 11:30 AM - 2AM. Res. 702 414 2220. Paris, 3655 Las Vegas Bl. S. 702 946 7000. 11AM - 12AM daily. 702 946 4346. This is over the top Las Vegas style. They offer a $777.00 burger. I don't get this brasserie stuff. A brasserie is a brewery. Paris 3655 Las Vegas Blvd. S. 6AM - 11PM, bar 24/7. Harrah's 3475 Las Vegas Bl.S. 702 369 5000. Mon. - Thu. 6AM - 2PM, Fri. - Sun. 24 hrs. American style coffee shop. See what this world has come to? I now list a restaurant that has the word pizza in it's name under American food. They also serve salads and sandwiches. This is part of a chain out of Southern California. Their food is very good, the pizzas are delicious and the price is very moderate for what you get. I like their food. Upscale featuring steaks and prime rib. Has a fireplace and other cozy interior accents. Nice room, nice food, fairly expensive. Serendipity 33570 Las Vegas Bl. S. 855 239 3931 or 702 731 7110 (hotel), 877 346 4642 (restaurant) Open Sun. - Thu. 8AM - 11PM, Fri. - Sat. 8AM - 12PM, Brunch Sat. - Sun. 11AM - 2PM. Groups of 12+ call 866 733 5827. This restaurant is the offshoot of the one that started in NYC in 1954. As you may have noted this is the second restaurant featuring American cuisine at C.P. But what a difference. This place serves the giant meatballs, BBQ ribs, triple decker grilled cheese sandwiches etc. You get the drift. $15. - $25 is their pricing, a very popular price point. Decent enough American style coffee shop. A bit on the pricey side. At Caesars Palace 3570 Las Vegas Bl.S. 855 239 3931 or 702 731 7110. Open 24/7. A casual, American eatery. Zagat says it is "moderately" priced. I checked and found prices between $25 and $45. You be the judge. Mandalay Bay, 3950 Las Vegas Bl. S. 702 632 7777. 558 Nevada Highway, Boulder City. This location was featured on that infamous TV Show, " Diners, Drive Ins and Dives". If you are a rider (Harley) you cannot go wrong here. There are always a bunch of them here on weekends. South Point 9777 S Las Vegas Blvd, Las Vegas, NV 89183 (702) 796-7111. About 7- 8 miles south from center Strip. Wynn,3131 S Las Vegas Blvd, Las Vegas, NV 89109 (702) 770-7000. 4500 W Tropicana Ave, Las Vegas, NV 89103 (702) 365-7111. Mandalay Bay, 3950 Las Vegas Bl.S., 702 632 7777. Sun. - Thu. 7AM - 11PM, Fri. - Sat. 7AM - 12AM. MGM 3799 Las Vegas Bl. S. 855 275 5733. Sun. - Thu. 5:30 - 10:30, Fri. - Sat. 5:30 - 11:30. Res. 702 891 3222. Two large private dining rooms are available. Hard Rock, 4455 Paradise Rd, Las Vegas, NV 89169 (702) 693-5000. Monte Carlo Hotel 3770 Las Vegas Bl. S. 888 529 4828. Res. 702 798 7151, priv.parties 702 385 1930. Planet Hollywood, 3667 Las Vegas Bl. S.
Open 24/7. Expect long lines, 702 463 0259. At the Bellagio Hotel/Casino, 3600 Las Vegas Bl.S.,888 987 6667. Open Daily 5PM - 10:30PM, Lounge Mon. - Thu. 5PM - 12PM, Fri. - Sun 5PM- 2AM. Groups 17+ call 702 693 7317, Res. 702 693 8865 or 666 259 7111. Simple American fare, that's how they advertise. I haven't tried it yet. The Orleans 4500 W Tropicana Ave, Las Vegas, NV 89103 (702) 365-7111. About 5 miles west of the Strip. Treasure Island 3300 Las Vegas Bl.S. 702 894 7111. 11AM - 12midnight. Saloon/dance hall 11AM - 2AM Sun.- Thu., 11AM - 4AM Fri. - Sat. This is a huge contry dance hall and bbq. Red Rock, 11011 W Charleston Blvd, Las Vegas, NV 89135 (702) 797-7777. Planet Hollywood, 3667 Las Vegas Bl. S. 877 333 9474. Sun. - Thu. 11AM - 12AM, Fri. Sat. 11AM - 2AM. 702 785 5555. The Quad, 3535 S.Las Vegas Bl. 702 731 3211. 10am -7pm. Wings, burgers, small bites etc. 7-16-14, the Clark County Health District inspector hit them with 28 demerits and a C grade. Pretty bad. Regular coffee shop fare with some specialties of the Hard Rock people mixed in. The menu is almost identical to the one of the Hard Rock in Berlin, Germany. And don't forget to look at all the rock memorabilia. I can't shake the feeling that these Hard Rock Cafes are somewhat overpriced. Rio, 3700 W Flamingo Rd Las Vegas, NV (866) 746-7671. Haha, they call it twisted farm food. Brunch Daily 6am-3pm. Paris, 3655 Las Vegas Bl. S. 702 946 7000. 24/7, breakfast, lunch and dinner. At the Cosmopolitan, 2708 Las Vegas Bl. S. 702 698 7000. Silverton, 3333 Blue Diamond Rd, Las Vegas, NV 89139 (866) 722-4608. Mon. - Sun. 10AM - 10PM. Res. 702 607 2665. Very simple food, even below normal coffee shop standards. Best to avoid unless money is a problem. R.R. is part of the Station Casinos chain of gaming places. This one is about 12 - 15 miles west of the strip, well worth a visit. Sun - Thurs 11am to 10pm, Fri - Sat 11am to 11pm Phone: (702) 220-7427. Must be 21 to enter. Hours vary. Bar food. The Cafe, 3950 Las Vegas Bl. S. 702 632 7777. This is actually inside THEhotel which is a separate building but still part of Mand.Bay. Open 7AM - 2:30 daily. 702 632 9250. I listed two locations for Manalay Bay. Why? I am the webmaster, that's why. in the Flamingo Hotel 3555 S. Las Vegas Blvd. Listen up all you parrotheads! Grab your sandals, shorts and flowered shirts and head down to this here place. Strictly fun. With a capital F. Three bars (at last count), two of them overlooking the strip. They are on decks second and third floor. How cool is that? They have island fare (West Indies) and some American stuff too. Entertainment with guys and gals on stilts doing their thing amongst the diners. A volcano with human sacrifice (during dinner) etc. More fun than Rumjungle (Mandalay Bay) or Rainforest (MGM). They also have a small stage for a band. I paid $13.95 for jerk chicken which turned out to be very good. My friend (the vegetarian) had the Gardenburger with a portobello mushroom burger set-up. Also very good. Nothing to complain about there considering the amenities. Drinks are VERY expensive. $7 for a margarita that can be had anywhere in town for $3 to $4 But then again; you are in the high rent district and you are getting FREE entertainment to boot. Monday - Thursday: 4pm - 9pm Friday: 4pm - 11pm Saturday: 11am - 11pm Sunday: 11am - 10pm. The Cafe, 3770 Las Vegas Bl. S. 888 529 4828. Sun. - Thu. 6AM - 1AM, Fri. -m Sat. 6AM - 2AM. At Caesars Palace, 3570 Las Vegas Bl.S. 855 239 3931 or 702 731 7110 (hotel) Open Sun,Mon,Wed,Thu. 11a m - 2AQM, Tue. Fri. Sun. 11AM - 4AM. 866 686 8624. Traditional American. They call it casual dining, I would wear a suit with those prices. ($15. - $25.). Did you notice this is the third restaurant at C.P. that calls itself "American" cuisine. The other two are Central and Serendipity. Must be a lot of Americans with spending power hanging out here. NewYorkNewYork, 3790 Las Vegas Bl. S., 702 740 6969. This an Irish pub, I had nowhere to park it at the moment. 11AM -11PM Bar until 2:45 AM, Happy Hour 2 - 5. 20+ call 702 740 6193. Indoor - outdoor next to the pool. Simple American food. Closes for the season. Re-opens in March. at the Mirage hotel, next to Treasure Island on the strip. 791-7111. This is the Mirage coffee shop. Decent enough as coffee shops go. But here is a little trick I use from time to time. When you spot a long line of customers at the entrance walk right in past everyone. There is a large counter in the rear. There is also a very decent Chinese restaurant way in back of the regular coffee shop. Lots of times they have seats available. In fact, the Chinese place also has a counter that has room when everything else is filled up. They serve good Dim Sum. None of it vegetarian though. Sugar Factory and Cafe, 3655 Las Vegas Bl. S. 702 946 7000. Across the street from Circus Circus, a little farther south. I was in Las Vegas when this place first opened and look both of us are still here. It is still the same cute old decor and the same good food and good pricing. You should drop in and watch the flames shoot out of the table in the bar. That master chef Wolfgang Puck has done it again. This is his fourth venue in Las Vegas I believe. And they are all excellent. This one I could call American contemporary. Beef, fish and shellfish. Very expensive and very high quality. Open for lunch and dinner. Prior to their regular dinner that starts at 6 p.m. they serve what is called an "intermezzo" starting at 3:30. It could be called "between the acts" if you wish. Check it out, money permitting. See detailed review Sun. - Thu. 11 - 10:30, Fri. Sat. 11 - 11. Res. 702 796 1110. Luxor, 3900 Las Vegas Bl. S., 877 386 4658. Daily 4 - 11PM, Later night menu: Sun. - Thu. 11 - 12AM, Fri. - Sat. 11 - 1AM. 7AM - 2:30PM. Steaks, seafood etc. Mandalay Bay, 3950 Las Vegas Bl.S. 702 632 7777. Very unique, american with Russian influences. They have a statu of Lenin at the front door. People complained about it so they cut the head of it off. Sun. - Thu. 4:30 - 10,Fri. - Sat. 4:30 - 12midn. 2000 Las Vegas Bl. S. 702 380 7777. Just look for the tall building at the North end of the Strip. Open 2AM - 7AM. 50's diner (where have I heard that name before?) They serve food that will kill you over time. It won't take too long either. Huge burgers, thick shakes, blue plate specials. Not bad when health concerns are not important. 3400 Las Vegas Bl.S. 702 791 7111. South Point 9777 S Las Vegas Blvd, Las Vegas, NV 89183 (702) 796-7111. About 7- 8 miles south from center Strip. Mostly burgers. Silverton, 3333 Blue Diamond Rd, Las Vegas, NV 89139 (866) 722-4608. Open 24/7. Breakfast and Lunch daily 6 - 3. 206 N 3rd St, Las Vegas, NV 89101 (855) 384-7263. 24/7. Open 24/7 They call it "Las Vegas Strip Cuisine". I did not know what to make of that. I think it maybe is a cafe. Sun. - Thu. 11AM - 10PM, Fri. Sat. 11AM - 11PM. Res. 702 607 6363. R.R. is part of the Station Casinos chain of gaming places. This one is about 12 - 15 miles west of the strip, well worth a visit. Sunday - Thursday: 4pm - 10pm, Friday & Saturday: 4pm - 11pm For reservations please call (702) 797-7576, For 10 or more (702) 797-7517. NYNY, 3790 Las Vegas Bl.S.. 702 740 6969. Bar food. Mon.- Thu. 4 -12Pm, Fri. - Sat. 112:30 - 1AM, Sun. 11:30 - midnight. Harrah's 3475 Las Vegas Bl. S. 702 369 5000. Country music and some vein clogging offerings for instance: a 100oz burger with a pound of fries, cheese, a quart of beer and fried twinkies, fried twinkies, fried baloney sandwich etc. Well, you get the drift. Toby himself shows up a couple of times a year. Sun. - Thu. 11:30 AM - 2AM, Fri. - Sat. 11:30 AM - 3AM. Groups of 12+ call 866 733 5827, res. 877 346 4642. Another of the numerous bar-restaurant operations that have sprung up in Las Vegas in the last few years. This one has the hi-tech interior with numerous TV monitors. The food and the beer are surprisingly good and reasonably priced. Since this is close to the strip, in fact close to the Rio it would not be much trouble to stop by and sample their fare. Parking is really convenient, practically at the entrance. American style eatery. Sun. - Thu. 6AM - 2PM, Fri. - Sat. 24 hrs. MGM 3799 Las Vegas Bl.S. 855 275 5733. Lunch and Dinner Sun. - Thu. 11:30 - 10:30, Fri. Sat. 11:30 AM - 11:30PM., Late Night 11PM - 6AM. Res. 702 891 3000. Mon. - Thu. 11 a.m. - midnight. Fri - Sun. 1 a.m. 2 a.m.
R.R. is part of the Station Casinos chain of gaming places. This one is about 12 - 15 miles west of the strip, well worth a visit. This is the one with all the beer. 130 of them, in fact. Restaurant Hours: Sunday - Thursday: 11am – 11:30pm, Friday & Saturday: 11am – 1am, Happy Hour & Late Night: Monday - Friday: 3pm - 6pm, Sunday – Wednesday 10pm – Close. American style deli. Opens Mon. - Thu. 11:AM, Fri.Sat. 8AM. At Paris Las Vegas, 3645 S. Las vegas Blvd. I was pleasantly surprised. An affordable Asian restaurant on the strip in a major hotel. With outdoor seating facing the strip! Very good miso soup and chicken stir fry lo-mein. My friend had the vegetable crepes which were also very good. Sun. - Thu. - 6 - 11, Fri. - Sat. til 12AM. Nice rack of lamb with peat jam or bbq salmon. Exquisite decor. 3500 S. Las Vegas Blvd. Inside the Forum Shops which are in turn inside (more or less) Caesars Palace. The lesser priced items are pretty mundane. The higher priced ones are excellent. What is it with all those wraps these days? I hope that fad disappears soon. I do not like them at all. Then there is the case of the raw fish (sushi). I still say (have been saying it for years) folks should stay away from that. Too dangerous. Overall a pretty good restaurant. If you can live with the noise. Sunday - Thursday: 11:30 am to 10:30 pm Friday & Saturday: 11:30 am to Midnight. "M", 12300 S Las Vegas Blvd, Henderson, NV 89044 (702) 797-1000. Sun. – Thur. 5:00pm - 10:00pm Fri. – Sat. 5:00pm - 11:00pm. At the Bellagio Hotel/Casino, 3600 Las Vegas Bl. S. 888 987 6667 (hotel). 5:30PM - 10PM. Traditional Hong Kong/Cantonese cuisine. 666-259-7111, or 702 693 8865. For groups of 15+ call 702 693 7317. Just about evrything I said about the Grand Wok can be applied to La Chine. In addition I found some of the food being served at Paris to be shaky in execution (i.e. the coffee shop and the buffet). No entrees under $15. Service tends to be slow at times. Japanes, Thai and Chinese. Exotic decor with a lot of masks, just like the name says. Very expensive, no entrees under $25. 11 - 3 daily. Res. 702 414 1444. At the Bellagio Hotel/Casino. 888 987 6667. Open daily 11AM - 2AM, Dim Sum Fri - Sun 11AM - 3PM. A noodle shop that puts on airs. Because you are at the Bellagio you are asked to fork over $15 for a plate of noodles. They got them from all over, China, Thailand, Japan, etc. Money people probably won't mind. Us riff-raff better go elsewhere. Too expensive. No reservations required. I used to be a frequent visitor at this establishment. Very frequent. I have always found the food offerings in the various restaurants wanting. You can give it a try when in the neighborhood. Prices are around $20 per entree. Pretty steep for Chinese food. Sun.-Thu. 11:30Am til midnight, Fri. Sat. until 1AM. 3700 W Flamingo Rd Las Vegas, NV (866) 746-7671. At Bally's Hotel/Casino, 3645 Las Vegas Bl. S. 877 603 4390 (hotel) 11AM - 2AM. Call for hours 702 388 8588. At Caesars Palace, 3570 Las Vgeas Bl. S. 855 239 3931 or 702 731 7110 (hotel). Open daily 11AM - 10:30PM 877 346 4642. $15-$25. Traditional Chinese. Groups of 12+ call 866 733 5827.
at the Aria Hotel 3730 Las Vegas Bl. S. center strip. 877-230-2742. Chinese soup, chicken, beef, noodles. 5:30 - 10:30pm. At the Cosmopolitan Hotel/Casino, 2708 Las Vegas Bl.S. 702 698 7000. Here is an interesting concept, a Chinese and a Mexican restaurant all in one . I have never seen this before. They also have two take-out windows, one for each menu. 11:30 to 11:30 daily. Lunch 11:30 - 3:30. 12 or less call 877 893 2003, 13 and up call 877 551 7776. I guess I will have to give them two listings, one for each menu. NewYorkNewYork. 3790 Las Vegas Bdlvd. S. (702) 740 6969. Breakfast Buffet Mon. - Fri. 7 - 12, Sat. - Sun. 7 - 12.Lunch/Dinner 11AM - 11PM daily. Lat Night Sushi Sun. - Thu. 10PM - 1AM, Fri. - Sat. 10PM - 1AM. Res. 702 740 6300. Traditional Cantonese. $25 - $40. 877 346 4642 (restaurant). Sun.Wed,Thu, 5PM - 10PM, Fri.Sat, 5PM - 11PM. Groups of 12+ call 866 733 5827.
at the Las Vegas Hotel 702-732-5755. Fairly expensive and a huge menu. The restaurant overlooks the pretty Benihana gardens. Traditional Hong Kong and Cantonese dishes and also some contemporary dishes. Looks out at the lake and fountains. Very expensive. I didn't see anything below $20 as far as entrees are concerned. Nevertheless, make reservations as soon as you can, they pack 'm in. The Orleans Hotel, 4500 W. Tropicana Av. Tel: 702-365-7111. About five miles west of the Strip. KJ Dim Sum and Seafood. Harrah's 3475 Las Vegas Bl.S, 702 369 5000. Chinese fusion. Mon. - Fri. 5 - 11PM, Sat. - Sun. 11:30 - 11PM, Lunch special Sat. - Sun. 11:30 - 4. Res. 877 346 4642, groups of 12+ 866 733 5827. Watch for unexpected charges. It is a rip-off joint. Despite the imposing entrance the food did not impress me at all. I had better food of this type elsewhere. Also; the smoking section is more or less not existing. The non smoking tables are next to smokers tables. What sense does that make? Sun. - Thu. 11AM - 12AM, Fri. - Sat. 11AM - 1AM, 702 836 0955. 206 N 3rd St, Las Vegas, NV 89101 (855) 384-7263. Sunday-Thursday 5:00pm -10:00pm Friday-Saturday 11:00am- 11:00pm . 401 S. 6th St., Las Vegas, Tel: 702-385-5016 . One of the oldest, if not the oldest, French restaurants in town. It also remains one of it's best. It can be a little pricey though, probably on account of all the successful law offices in the vicinity. I would not stray too far from the parking lot in this neighborhood. A bit crummy to say the least. The food is magnificent, if you can afford $25 for a piece of fish or $35 for a rack of lamb. I would call the decor French country, really nice and relaxing. This is top notch French cooking from appetizers to desserts (where can you get a souffle Grand Marnier these days?). If you are rich, or feel rich, this is the place to be for dinner. And I am not a paid flunky for Andre. 3770 Las Vegas Bl. S. 888 529 4828. Res. 702 798 7151, priv.parties 702 385 1930. More American gourmet than French. I listed it here anyway. Dinner Mon. - Sat. 5:30 - 10:30. Lounge Mon. - Sat. 5 - 12. Res. 702 632 7200.
at the Aria, center Strip 3730 Las Vegas Bl. S.
It is a Michael Mina restaurant. It is on the second floor. Open 5 to 10:30 p.m. daily. Saturday and Sunday brunch 10 a.m.- 2:30 p.m. Oyster Bar 3PM - 10 daily and 5PM Res. 702 414 6200. - 10 nightly. At the Cosmopolitan Hotel/Casino, 2708 Las Vgeas Bl. S. 702 698 7000. Dinner Fri. - Sun. 5. - 11. 12 or less call 877 893 2003, 13 and up call 877 551 7776. Daily 11:30 A.M. - 11:00 p.m. Lunch 11 - 4 daily, Dinner Sun. - Thu. 5 - 10, Fri. - Sat. 5 - 10:30. MGM Grand 3799 Las Vegas Bl. S. 855 275 5733. Fri. - Sat. 5:30 - 10:30, Sun. - Thu. 5:30 - 10. Dinners start at $120. 6+ call 702 891 7433, Res. 702 891 7925.
same as above. Daily 5 - 11. Res. 702 891 7358, 7+ 702 891 7433. Watch those numbers, they are different from above. Paris, 3655 Las Vegas Bl. S., 702 946 7000. French/Italian. Daily 5 - 10:30, 877 346 4642.
in the Bellagio, 3600 Las Vegas Bl. S. 5:30 - 10PM 866 259 7111. For groups 15+ call 702 693 8865 Closed Mondays. Extremely expensive and good. Not a place you could frequent on a daily basis. Lamb, duck and risotto are some of the items on the menu. I have seen several A ratings for this place in popular local publications. I checked some prices. The :degustation" menu is $135. basic. Wine pairings add between $60 and $90. This does not include any extras you may want (or the tip). Sun. - Thu. 6 - 10, Fri. - Sat. 6 - 10:30. In the Paris Hotel on S. Las Vegas Blvd. The seats in the conservatory overlook the fountains at the Bellagio across the street. Good food, high prices, elegant decor are the hallmarks here. Looks a bit like a Parisian restaurant. Steaks and shellfish are their forte.7AM - 11PM daily. 702 944 4224. Here is a very unusual concept: a bistro, a chocolate shop and pastry shop all in one. Breakfast daily 6:30 AM - 11:30AM. Lunch daily 11:30AMK - 2:30PM. Dinner Wed.-Sun. 5PM - 10PM. Pastry Counter 6AM - 11AM. Groups of 12+ caLL 866 733 5827. Dinners go for $25 - $40., not cheap. 702 731 7292 (restaurant). DID I MENTION THE FLOOR TO CEILING CHOCOLATE CLOCK THAT DISPENSES FREE TRUFFLES? This one is for the art lover and gourmet. Has the Mobil Five Star Award, one of only two in Las Vegas (as of this writing). Exec. chef Julian Serrano. You may have seen him on the food channel. Wed - Mon. 5:30 9:30. Closed Tue. Reservations 866 259 7111. For groups 15+ call 702 693 7317. This is French and Spanish regional cuisine. Julian has another another dining facility in the Aria hotel under his own name. Stratosphere, 2000 Las Vegas Bl.S. 702 380 7777. Res. 800 99 TOWER, 15+ call 702 383 4777. I had dinner there sometime ago, very good. The area around it is very shakey, so is the parking structure. Use valet, if possible. French cuisine, $40+, Wed - Sun. 5:30PM - 8:30PM. Closed Mon. Tue. 702 731 7286 (restaurant). Touted as a faithful replica of the Hofbrauhaus in Munich, there are three venues within the Hofbrauhaus. The bar at the entry is a smaller, cozy one with TV's showing sports. In the big dining hall, guests sit on wooden benches at long tables under an elaborate 40' high vaulted ceiling with Bavarian-style painted frescoes. If the oompah band is playing, you won't be able to do much talking. The food here is an extensive menu of all the authentic German favorites - and hearing a lot of German spoken among the staff, we think they know their product. Servings are generally huge and moderately priced. The indoor "beer garden", another huge room, has trees and a sky and outdoor-style furniture and manages to achieve the air of the outdoors (and is a bit quieter). Three beers - a light, a dark and a wheat - are imported directly, ranging in size from the 10 oz. ($3.50) to the 2 liter (about ten bucks). The wheat beer is especially good. Girls in costume meander through the seats with baskets of pretzels made with imported pretzel dough. The menu and atmosphere are more conducive to dining than to drinking and noshing. The parking lot is small and often full; a taxi might be the best way to go. At the Cosmopolitan 2708 Las Vegas Bl. S. 702 698 7000. Moonlight Menu Sun. 4 - midnight. 12 or less call 877 893 2003, 13 and up call 877 551 7776. Very odd ( my opinion). Daily 5:30PM - 6AM, Lunch Sat. - Sun. 12 - 3. Typical slick consultant-designed restaurant with a flavor of big-city interior desecrators and trendy menu - not to say that it doesn't work because it has all the atmosphere and menu selection you expect out of one of these places. Well prepared food w/ a twist on the usual Italian ingredients (how about potatoes and green beans in your pasta?) Average dinner entree $10-17 a la carte. Frank Sinatra serenading you incessantly in the background. 3555 Las Vegas Bl.S., 702 4141000. 5 - 11 daily. Res. 702 266 9977. Tropicana, 3801 Las Vegas Bl.S. 702 739 2222. 7700 Las Vegas Blvd. S. 702-736-4939. Does it seem to you this restaurant has been around forever? Well, you are right! Lorraine Hunt (who was also our Lt. Governor) and her husband "Blackie" have operated restaurants in Las Vegas at least since the '40s. Their last venue was on Eastern near Tropicana Av. They must be doing things right to be able to stay in business this long. And they do. Some of the best italian food in town. They also have dishes for the vegetarian crowd. We had some very good veggie lasagna for around $11. also a regualr meat lasagna for $11. I recommend this restaurant heartily. Also a very good location for tourists driving in from Cal. Just drive South on the Strip (Las Vegas Blvd.) for about five miles. The building will be on the left going south. Sun. - Thu. 11:30 - 10, Fri. - Sat. 11:30 - 11PM. Res. 702 607 2355. 4155 S. Buffalo Dr. Tel: 702-248-7084. These people serve good, no, delicious food. But where is it written Italian food must be so expensive? Fried calamari about $10, Caesar salad about $9 sounds pricey to me. Make no mistake, the food is excellent if not too affordable. If the money does not matter than try the chicken piccata at $14.50. Oh, I think chef Piero Broglia has been in town as long, if not longer, as me (going onto 30 years). See detailed review Sun. - Thu. 11 - 11, Fri. Sat. 11Am - 12PM. Res. 702 733 0070. 7:30AM - 11PM daily. Res. 702 437 9800. Sun. - Thu. 5 - 11, Fri. - Sat. 5 - midnight. Traditional Italian, pasta, pizza, steaks and chops. Daily 5:30PM - 11PM. Fri-Sun 6PM 11PM. 12 or less call 877893 2003, 13 and up call 877551 7776. 5pm - 10pm (Sunday - Thursday) 5pm - 11pm (Friday & Saturday). Sun-Mon 5:30 - 10, Tue. - Thu. 5:30 - 10:30, Fri. - Sat. 5:30 - 11. Res. 702 891 7600. 12+ 702 891 7433. Italian fast food, Pizza etc. 11a.m. til midnight. five50 refers to the ideal temperature for baking a pizza, 550 degrees. NYNY, 3790 Las Vegas Bl. S.702 740 6969. Breakfat 7:30 - 10:30, Lunch/Dinner 11:30 AM - 12AM. Res. 702 740 6403. Northern Italian cuisine. Sun.- Thu. 5 - 10:30, Fri. - Sat. 5 - 11. (all pm). 11AM - 2AM, 702 454 3450. Pizzaria. Sun. - Thu. 5PM - 12AM, Fri. - Sat 5PM - 1AM. Res. 702 414 3772.
at the Mirage, 702- 791-7111. A huge wine list, regional Italian and nouvelle American cooking. Expensive and dinner only. At the Bellagio Hotel/Casino, 3600 Las Vegas Bl. S. 888 987 6667. Open Tue. - Sun. 5:30 - 10:30. 866 259 7111, or 702 693 8865. Traditional Tuscan (Italian) cooking. Also steaks and seafood, home made pasta. For groups of 15+ call 602 693 7317. This is a branch of a New York City restaurant by the same name. Very original, circus based, decor. 11AM - 11PM. Res. 702 677 3390. Here is one of those restaurants where had you had a half price coupon you would have been perfectly happy with your meal. If on the other hand however you pay full price I would not really recommend it. Here is a for instance: assorted noodles, assorted sauces. Create your own combo. That would be fine with good noodles and good sauces. My noodles had been cooked in plain water instead of in slightly salted water. And how difficult can it be to get some fresh herbs into the kitchen. Basil, Rosemary, Sage, Oregano etc. All in all, if you want Italian, there must be some better choices. Treasure Island, 3300 Las Vegas Bl.S. 702 894 7111. Sun. - Thu. 11AM - midnight, Fri. - Sat. 11AM - 1AM. Mirage, 3400 Las Vegas Bl.S. 702 791 7111. Thu. - Mon. 5 - 10, Lounge Thu. - Mon 5 - 10. Reserv. 866 339 4566. Groups of 11+ call 866 733 5827. I looked at their little write up. It says "simple, honest, home cooking Italian style. Home cooking at $25 - $40 a plate. Think about it. Modern Italian. Open seven days for dinner only. Mon. - Thu. 5:30 11, Fri. - Sun. 6 - 11. Under 12 call 877 893 2003, 13 and up call 877 551 7776. Dinner Sun. - Thu. 5:30 - 10, Fri,. Sat. until 10:30. Close to Eastern Av. on the North side of Tropicana. Very nice airy decor. Something a little bit away from the usual. They offer Waiters on Wheels service. This place is clearly aimed at middle America. Luncheon specials are available. The food is middle of the road, nothing earth shaking but considering the price it isn't bad. Not worth going out of your way for. If you are in the vicinity and are hungry than give it a try. Moderately priced. Terra Rossa = Red Rock, got it? Red Rock, 11011 W Charleston Blvd, Las Vegas, NV 89135 (702) 797-7777. 2241 N. Green Valley P'way, Henderson, Tel: 702-454-4211. It is listed in the tel. directory as "Greens Supper Club", the building itself is marked "The Greens". And it is not a vegetarian restaurant either, Apparently a reference is made to the nearby golf club, or maybe the owner is a golfer. Anyway, it is a very nice small dinner house situated in the large shopping center on the west side of Green Valley P'way. The food is much better than in many other similar places and not as pricey. I also noticed the wait staff was very professional. They were able to answer all my questions correctly. I had the linguine with pesto sauce ($10.95), my friend had the baked rigatoni ($6.95). Both items were very good. Also the bread and Greek salad ($3.50). I noticed the clientele as they arrived were mostly middle age and well dressed. Sort of upscale if you will. They also have an extensive wine list. That one is a little on the expensive side. All in all a very pleasant dining experience. Sun. - Thu. 5 - 10, Fri. - Sat. 5 - 11. At the Four Seasons, 3960 Las Vegas Bl. S. 702 632 5000. You can drive up to the front door on the Strip or you can park yurself in the parking structure behind Mandalay Bay. This hotel is actually inside M.B. For hours you better access the internet. There quite a few . Italian seafood. Lunch 11:30 - 4 daily, dinner 4 - 12 daily. Res. 702 414 3500. There are several Benihanas arount the country. If my memory serves me a guy that used to be on a Japanese olympic wrestling team introduced the concept to the U.S. I think his name was Rocky something or the other. I'll have to look it up. By concept I mean tableside teppan cooking ( teppan yaki). I think everyone should visit this place at least once in their life. It is a lot of fun and the food is amazingly good, albeit expensive. The chefs at work are quite the showmen what with cleavers and knives flying through the air. At the Cosmopolitan Hotel/Casino, 2708 Las Vegas Bl. S., 702 698 7000. Sun. - Thu. 5PM - 1AM, Fri. - Sat. 5PM - 2AM, 12 or less call 877 893 2003, 13 or call 877 551 7776. Lobster, steak sushi and more. Sushi bar with a large assortment of Japanese sake, beer and wine. They also have teppanyaki dining in a garden type setting. Fairly expensive. Planet Hollywood, 3667 Las Vegas Bl. S., 877 333 9474. Sun. - Thu. 5:30 - 10:30, Fri. Sat. - 5:30 11:30, 702 454 4555. Mirage, 3400 Las Vegas Bl.S. 702 791 7111. 5 - 10 daily. Lounge: Sun. - Thu. 5 - 10, Fri. - Sat. 5PM - 12AM, late night menu Fri. - Sat. 10 - 12Am. Lounge opens at 5PM daily. Sushi, sashimi and sake. 11:30AM - 11PM daily. At Caesars Palace 3570 Las Vegas Bl. S. 855 239 3931 or 702 731 7110 (hotel). This is interesting, Nobu is actually inside the Nobu Hotel which in turn is inside C.P. We have a similar situation at Mandalay Bay where the Four Seasons is inside M.B. There is a second location at:Hard Rock, 4455 Paradise Rd, Las Vegas, NV 89169 (702) 693-5000. Sunday - Thursday 6:00 pm - 10:30 pm, Friday - Saturday 6:00 pm - 11:00 pm. Luxor, 3900 Las Vegas Bl. S.877 386 4658. Sun. - Thu. 5 - 10. Fri. - Sat. 5 - 10:30. Res. 702 891 3001, 10+ 702 891 7433. Private dining for 80 available. Sun. - Wed. 11:30 - 1AM. Thu. - Sat. 11:30 - 2AM, Res. 702 607 0700. It's japanese, Peruvian and Brazilian. At the Aria Hotel/Casino, 3730 Las Vgeas Bl. S. about center Strip. 5 - 11p.m. 877-230-2742. Traditiona Japanese teppan restaurant. Chef Masa Takayama (does that name ring a bell? If not look at the Bar Masa Restaurant). Actually this restaurajnt is inside the BARMASA, it is part of it, just a separate listing. 953 E. Sahara Av. Tel: 702-735-7070. Just as I was about to do a write up on this place the Clark County Health Department staged an enormous raid on this run down and dilapidated shopping center. Numerous restaurants received citations. So, I better leave it alone. That place is not very safe at night anyway. But it does have a lot of Japanese and Korean businesses. There is also one Thai and one Chineses restaurant. at the Aria Hotel, center strip, 3730 Las Vegas Blvd. S. 877-237-2742 for reservations. Saturday 5-11pm. Exec. Chef Masa Takayama. He claims his fish for sushi is served within 24hrs. of being caught. Early dining menu is $49. At the Bellagio Hotel/Casino, 3600 Las Vegas Bl. S. 888 987 6667. Open Mon.-Thu. 5PM - 10PM, lounge until 11PM Fri. - Sun 5PM - 11PM, lounge until 12PM.Traditional and modern Japanese cuisine. Res. 666 259 7111 or 702 693 8865. Groups of 17+ call 702 588 5624. Sunday - Thursday 5 p.m. - 11p.m., Friday - Saturday 5 p.m. - 1 a.m.
Sun. - Thu. 11 - 11, Fri. - Sat. 11AM - 12AM. Res. 702 6207. Specializing in margaritas. There must be at least 30 different that can be had. Otherwise a regular Mexican restaurant. Moderately priced menu. Invented by a couple of ladies you might have encountered on one of the food channels. Susan Feniger and and Mary Sue Milliken. Refreshing and light decor, excellent food with a different twist. Moderately priced, be prepared to spend a few bucks. I would not call their food creations out and out Mexican per se, but more of a Southwestern and Mexican fusion type cuisine. There is an extensive menu with lots of selection, but the main point is that someone in the back knows how to cook. Everything we have tried is flavorful - even the leftovers were good cold the next day. Dishes like the Too Hot Tamale assortment and the Portabello Mushroom Mulitas are typical - a lively variety of flavors as interesting as the spirited decor. The red salsa served with your chips is always a good indicator of the overall quality of the meal to come; here it is flavorful and moderately hot, with good smoky chile flavor. The outdoor dining area is at the edge of the jungle-like Mandalay pool area and has built-in entertainment in the form of the jogging track, good for people watching. A fun experience and a flavorful meal. Dinner Mon. - Thu. 11AM - 10PM, Fri. 11AM - 11PM, Sat. 10AM - 11PM, Sun. 10AM - 10PM. Res.702 632 7200. Unusual set-up. You can dine off the menu or partake of the buffet which runs simultaneously. Food is decent for the price and a huge salsa bar is included. Actually, come to think of it, I rather enjoyed my meal there last time. The Orleans Hotel, 4500 W. Tropicana Av. Tel: 702-365-7111. These folks feature a Southern theme in their hotel. I think they are way south here, namely in Old Mexico. This restaurant is decent and moderately priced. A bit away from the strip, in other words mostly visited by locals. Res.and groups over 18 call 702 730 7979. A taste of Old Las Vegas, before the corporations took over. The restaurant is in a tiny old building on Main St. among weekly hotels, thrift shops, artists' studios, trendy cafes and environmentalists. The seats fill up at lunchtime with lawyers, civil servants and financial folks who work nearby. Just great homestyle Mexican food, made by a family who has run the restaurant since the 1950's. The food is flavorful southwestern Mexican fare, with the expected burritos, huevos rancheros, chiles rellenos, albondigas soup. Portions are sizeable, about $10-$13 per entree. Menu prices are refreshingly in whole dollars - none of this $-.99 stuff. A nice escape from the generic glitz of the Strip into the past and present of locals' Las Vegas. Sun. - Thu. 5 - 10. Fri. - Sat. 5 - 11. Happy Hour 5 - 7. Res. 702 891 3200. Inside the Aria Hotel/Casino, 3730 Lasw Vegas Bl.S. 866-590-3637. 11;30 - Midnight. Authentic Mexican Cuisine and handshaken Margaritas with their huge selection of top quality Tequilas. Friendly little family place not too far from the strip. Average food, good salsas. The reason I mention this place at all is because it is very clean and cleanliness is at a premium in this type of restaurant. On certain days they have a musician (or several) playing romantic music. Extensive menu includes all the favorite dishes and quite a few seafood selections. Yes, there is also roast goat on the menu. Probably the only place in town with that item. Authentic flavor prepared by good cooks. Service and food are not bad for the price. Sunday - Thursday: 11:00 am to 10:00 pm Friday and Saturday: 11:00 am to Late Night. Lunch 11 - 6PM, dinner 6PM - 1o. Bar 11AM - until the last drink is served. At the Flamingo Hotel/Casino, 3555 Las Vegas Bl. S. 702 733 3111. 11 - 11PM daily. Happy Hour Mon. - Fri. 2PM - 8PM, Brunch Sat. - Sun. 11AM - 3PM with live mariachi. At Bally's Hotel/Casino.3645 Las Vegas Bl. S. 877 603 4390 (hotel). Casual Mexican, average entree $8. Bar 10AM - 6AM, Restaurant 11AM- 6AM, 702 967 4111 (restaurant). In colorful Boulder City, in the Von's Plaza, at the second traffic light as you drive in from Las Vegas. You cannot miss, there are only two traffic lights in town. Mexican/Southwestern. Call for times, 702 785 0122. Sam's Town hotel, 5111 Boulder Highway, Tel: 702-456-7777 (hotel), 454-8044. Their claim to fame are the huge portions and the huge margaritas. Not exactly my bag. If you are hungry and want to put on the old feed bag, hoof it over there. They will assign you a stall and shovel in the grub. Moderate pricing. Venetian, 3555 Las Vegas Bl.S., 702 4141000.Lunch 12 - 3, Dinner Sun. Thu. 5:30 - 11, Fri. Sat. 5:30 - 11:30. Res. 702 414 3772. The Orleans,4500 W Tropicana Ave, Las Vegas, NV 89103 (702) 365-7111, about 5 miles west of the Strip. South Point 9777 S Las Vegas Blvd, Las Vegas, NV 89183 (702) 796-7111. About 7- 8 miles south from center Strip. 12 - midnight, seven days a week. Rio,3700 W Flamingo Rd Las Vegas, NV (866) 746-7671. The Orleans, 4500 W Tropicana Ave, Las Vegas, NV 89103 (702) 365-7111. A few miles west of th Strip. At the Aria Hotel/Casino 3730 Las Vegas Blvd. S., Center Strip. American seafood and steaks, seasonal ingredients. 5 to 10;30pm. Cafe Hours Mon. - Sun. 11:30 - 3PM and 5:30 - 10PM. Dinner 5 - 10. Res. 702 891 7374, 14+ 702 734 0025 (x14). Harrah's, 3475 Las Vegs Bl. S. 702 369 5000. Sun. - Thu. 11:30 - 11PM, Fri. - Sat. 11:30 - 1AM. Groups of 12+ call 866 733 5827. Treasure Island, 3300 Las Vegas Bl. S. 702 894 7111. 5 - 10 daily. Bar Mon. - Thu. 1PM - 2AM, Fri. - Sun. 11AM - 2AM. Res. 866 286 3809. Shaquille O'Neal has been spotted here. The place is close to Rancho, I think about a block or so east. They got it all here in a plain setting. By plain I mean paper plates and aluminum cooking pouches. But the flavor is terrific. When I got there I saw some guys with fancy footwear and huge gold chains hanging around. So, that made me feel a little uneasy. Meals run about $14.00 for the BBQ stuff. They also have some Creole items. If you are really into this type of dining you can get lucky and get there when they have chitterlings or pigs feet on the special. Some nice desserts. I had sweet potato pie one day and it was real good. I also had the jambalaya which was very good with lots of hot links and shrimp. A bit spicy, but that should be expected. It was not cheap, lunch cost me ten bucks, which I find pricey. I could be wrong. 2590 S. Maryland P'way, 702 939 4444. What is southwestern cooking? That question has been asked of me many times over the years. And it is really hard to define what actually is meant by that term. Let me give you some examples. There is Mexican cooking from south of the border. There is Mexican cooking from north of the border. The two do not have that much in common. There is Tex-Mex, there is New Mexico cuisine, Santa Fe style cooking, California style and California nouvelle., there is cowboy cooking and nouvelle Mexican, If all these different cuisines can be reduced to a common denominator I would say it is this: corn, beans, rice, chile and squash. Whereas in pre-columbian Europe only a few types of beans were known the original inhabitants of the American southwest had quite a few varieties of them. For example the Anasazi bean, found in centuries old middens. They also grew corn in quantities and probably tomatoes, although I suspect the tomato to have been introduced into this region by the Europeans. It is more of a South American item. The native Americans also had lots of different squashes and gourds. Another item high on their list was the pine-nut or pinion nut. Pinion forests literally cover the southwest like a blanket above a certain elevation. 3500ft come to mind. They also used the nuts gathered from the Mesquite trees that grow in abundance. Another favorite, still being used today, is the prickley pear, a fruit of a certain cactus. It has to be handled in a careful manner because of its sharp spines or needles. A surprisingly large number of herbs were in use from the exotic bubble gum plant and the epazote to the more conventional equivalents of sage, rosemary, lavender, oregano and mint. We now have a fusion cuisine that uses a lot of the original produce and some products not originally found here. I therefore call all of the above mentioned cuisines southwestern cooking. Personally, I do a lot of my spice and herb shopping in Mexican markets. Not only are they fresher and cheaper, they also come in a lot more varieties. At the Flamingo Hotel/Casono 3555 Las Vegas Bl. s. 702 733 3111. At Caesars Palace 3570 Las Vegas Bl.S. 855 239 3931 or 702 731 7110 (hotel). This place is a creation of Bobby Flay. Are there any amongst us who haven't heard of him? He has been over all the food networks on TV. This is a Southwest dining concept. For an explanation read my preceding column. Call for hours 702 894 7390. Poolside during season. Tropical BBQ. Classic Spanish cuisine. Julian can be seen quite often on the food network. I actually had lunch there recently. Liked it a lot, maybe because I didn't pay for it. They make their Paella right there in the dining room in huge Paella pans over an open wood fire. They serve several different Paellas at the same time. I think one is shrimp, one is sausage and I forgot the third. Very interesting all the same. They are located near the registration. Here is a pleasant surprise: the have a vegetarian menu. At the Cosmopolitan, 2708 Las Vegas Bl.S. 702 698 7000. 12300 S Las Vegas Blvd, Henderson, NV 89044 (702) 797-1000. Steaks and seafood. Sun. – Thur. 5:00pm - 10:00pm Fri. – Sat. 5:00pm - 11:00pm. It is about 10 - 12 miles South of center strip but well worth a visit. Especially the buffet. Tropicana, 3801 Las Vegas Bl. S., 702 739 2222. Sun. - Thu. 5 - 10, Fri. Sat. 5 - 11. Res. 800 462 8767. Monte Carlo, 3770 Las Vegas Bl. S. 888 529 4828. They advertise a 120oz steak for 6 persons. Wynn,3131 S Las Vegas Blvd, Las Vegas, NV 89109 (702) 770-7000 ( it is really in the ENCORE the new tower. 6 - 10 nightly, late night menu Wed. - Mon. Daily 5:30 - 10:30, Happy Hour 11AM - 7PM. 702 784 8821. At the Four Seasons, 3960 Las Vgeas Bl. S. 702 632 5000. Mandalay Bay, 3950 Las Vegas Bl.S. 702 632 7777. Same hours. Res. 702 632 7200. You want to bask in the reflected glory of that TV personality Emeril Lagasse? Bam, kick it up a notch, get over here, this is his place. Chicken, steaks and seafood at outlandish prices. I doubt you'll run into Emeril. He's in Hollywood doing his thing. Some trivia: I think he worked (or works) at the same place in New Orleans as Paul Prud'homme. and that other famous chef whose name I forgot. Lunch Mon. - Sat. 11:30 - 1:45, Dinner Sun-. Thu. 5 - 10, Fri. Sat 5 - 10:30. Res. 702 414 1992. Lunch Mon. - Fr. 11:30 - 4, Brunch Sat. - Sun. 11 - 4. Dinner Sun. - Thu. 5 - 10:30, Fri. - Sat. 5 - 11. 702 948 6937. NYNY, 3790 Las Vegas Bl.S. 702 740 6969. Dinner Sun. - Thu. 4 - 11, Fri. - Sat. 4 - 12, Lunch 12 - 4PM at the bar Res. 702 740 6450. 4:30 - 10:30 daily. Lounge Sun. - Thu. 4:30 - 10:30, Fri. - Sat. 4:30 - 12. Inside the Aria Hotel/Casono. 3730 Las Vegas Bl. S. just about center strip. 877-230-2732. 5 - 10:30 p.m.
Well known chef Jean Georges Vongerichten (sounds German but I think he is French)..Very expensive (for me anyway) Early dinner can be had for $69 per, after that it is up, up, up. There is a tasting menu for $109. This place is located near the Zarkana Theater. They serve Australian "Wagyu" beef cooked over an open flame. Why is that better than a Hereford or Holstein? Stratosphere,2000 Las Vegas Bl.S. 702 380 7777. 3 - 11 daily. Res. 800 99 Tower, 18+ 702m 383 4777. Steaks and seafood. 3655 Las Vegas Bl. S. inside the Paris hotel. I sure would like to know the name of the V/P in charge of the hotel. They messed up on several fronts. The story of these restaurants is very convoluted. Case in point. This started out as a French restaurant with French decor, and a snooty French menu, the whole bit. Now it is a "so called" steak house, with French decor and semi snooty French menu. After all, how do you explain shrimp pierrade ($13) and tarte of duck cassoulet ($11) in a steak house? Their claim to fame is a 50oz (you are reading it right, fifty oz) porterhouse steak. So, ok the food is good. Not earth shaking. I go to a steak house I want my New York cut (here at $30), my spuds (here they call them gaufrettes at $5, or roesti at $5. they also have fingerlings at $5,(I bet those are the americanised pommes pont noef), and, above all, I want my beer. I just do not like steaks with wine. Some of the seafood dishes are very nice, for instance salmon $25, tuna $24, striped bass $26. Some nice desserts are the strawberry mousse $8, the creme brulee $8. and the lemon cream praline at $7. All in all very good but very expensive. If only that French decor wasn't there, not very macho. Call chef David Sacco and tell him you read it here!! At the Bellagio, 3600 Las Vegas Bl. S. 866 259 7111. For groups 15+ 702 693 7317. Sun.-Thu. 5:30 - 10. Fri.-Sat. 5:30 - 10:15. Closed Wed. I checked some pricing: a N.Y. strip steak runs $78., swides are $12. Lobster and Caviar - market prices. They also serve seafood. Call for hours. 702 607 6333. I don't exactly know what it means. 5 - 10 daily, bar Sun - Thu. 4PM - Happy Hour, Fri. - Sat. 5 - 10. Res. 866 b286 3809, 0r 702 894 7223. Call for hours. 702 414 8888. At Caesars Hotel/Casino 3570 Las Vegas Bl. S. 855 239 39 31 or 702 731 7110. (hotel). This place is plenty pricey, dinner starts at $40. Traditional steakhouse says it best. At the Bellagio Hotel/Casino, 3600 Las Vegas Bl. S. 888 987 6667. Open daily 5: 10 PM. Steaks, seafood and lamb. It is another place by Jean Georges Vongerichten. He has one at the Aria hotel. Check the listing above under Jean Georges. For groups of 15+ call 702 693 7317. Has been around a while. They now have two locations in town. Mirage, 3400 Las Vegas Bl. S. 702 791 7111. Sun. - Thu. 5 b- 9, Fri. - Sat. 5 - 10. Res. 866 339 4566. Sun. - Thu. 5 - 11, Fri. - Sat. 5 - 11:30, 702 737 5200.
at the Bellagio Hotel/Casino, 3600 Las Vegas Bl. S. 888 987 6667.Open Tue.-Sun. Closed Mon. Cocktails: 3PM - 4PM. Bar Menu: 4PM - 5PM. Cocktail AND bar menu: 9:30PM -p 10:30PM. Dinner: 5:50PM - 10:30PM. Groups up to 20 call 702 693 7317 Groups up to 50 call 702 293 7057. Restaurant reservations call 666 259 7111 or 702 693 8865. If the above is too confusing you may call me and I will take you by the hand and show you around. I have been in town for 40 years.I am waiting for you call. There will be a small fee commensurate with the prices charged by various Strip dining fascilities. Steaks and seafood. 5 - 11 nighlty, Lounge 5 - 12 nighlty. Res. 702 262 4852. 10+ call 702 262 4720. Seems like "Old San Francisco" in decor. Excellent steaks and very affordable. If you are a meat lover this would be the place to be. At the Excalibur hotel/casino, 3850 Las Vegas Bl.S. 702 597 7777. American style dinner house. 3 course prix-fixe meal $ 37., kids meal starts at $7. Open nightly 5 - 10.Res. 702 597 7449. Sun. - Thu. 5:30 - 10, Fri. Sat. 5:30 -10:30. Res. 702 891 7318 8+ call 702 891 7433. Also; Tom C. Heritage SteakMirage, 3400 Las Vegas Bl.S. 702 791 7111. 206 N 3rd St, Las Vegas, NV 89101 (855) 384-7263. LUNCH Monday-Friday 11:00am - 4:00pm DINNER Daily 4:00pm - 10:00pm 702.384.2761. Rio,3700 W Flamingo Rd Las Vegas, NV (866) 746-7671. Nightly 5pm-11pm. 702-777-7800. At the Aria Hotel/Casino, 3730 Las Vgeas Bl. S. just about center strip.877-230-2742. 11a.m. - 2 a.m. Traditional Thai cuisine. They are located near the Baccarat room (surprise!). Tasting menu $59. Food is served family style. It is listed on the Wynn website, but I have no details at all about it. 2910 Lake East Dr. Las Vegas, 702 254 5382. I have been in Nevada almost fourty years, ten in Reno, thirty in Las Vegas. I have travelled to every nook and cranny of this state and have dined at probably every buffet in this state from the lousy ones in Laughlin,Sparks and Elko to the superb ones in Las Vegas. The trouble with folks rating buffets in Las Vegas is they get to Las Vegas from Dirty Dungaree, Iowa, stay three days and then feel qualified to give an opinion without having had the opportunity really to do some comparison shopping. It is the Strip buffet mostly that gets rated. Well, there are buffets off the Strip that are far superior considering price and ambience than anything you can get on the Strip. I find a $4.95 luncheon buffet with a limited menu more valuable than a $14.95 luncheon buffet with a large selection. After all, how much can you eat?. We locals know it and take advantage of it, heck we get half price coupons sent to us by mail, we ask for senior discounts and get them. But, since most tourists are under time constraints I need to rate a goodly number of Strip buffets as well. In summation: avoid Strip buffets if at all possible. Most of the buffets listed in this section try to appeal to those folks who do not want to spend a lot of money on food. I have tried them all and some of them are real bad. If you like good eats for a reasonable price than stay away from those places that have a red mark. Every major (and minor) hotel in town features a buffet. No other way to feed the masses of people that come to Las Vegas on a daily basis efficiently and quickly. After all, we can't have them sitting around a dining room table when they could be sitting at a gaming table. For that same reason the rstaurants, buffets, change cages etc. are all located towards the end of a casino. I am talking about buffets that are not in hotels. I have checked on quite a few buffets around town, chinese, indian, mexican etc. etc. I have come to the conclusion they are really not worth it. 3730 Las Vegas Bl. S. center strip. This buffet is very good. Good value for the money too. I highly recommend it. And a very unusual food presentation, for a buffet anyway. The pricing is very strange, different prices for different times/days. Bacchanal 3570 Las Vegas Bl.S. 855 239 3931 or 702 731 7110.(hotel). 702 731 7928 (restaurant). Lunch 11Am - 3PM..Dinner Sat. - Sun. 3Pm - 10PM. Groups of 12+ call 866 733 5827. In Primm, NV., Tel: 386-7867. I have eaten there once and I haven't been back. Breakfast $6.00, lunch $ $7.00, dinner $8.00. Besides, this place is 35 miles south of Las Vegas. Why do I even bother? The same goes for the place across the street, Whiskey Pete's. Huge is the watchword here. This place has been known to seat as many as 10,000 diners per day. The value here is excellent. Don't expect gourmet, but you only pay four or five bucks per person. Not bad at all compared to some places on the strip. At the Excalibur Hotel/Casino (where else? ), 3850 Las Vegas Bl. S. 702 597 7777. Just copy what I said about the CircusCircus above. It is mass feeding, like the army. Very affordable. 2400 North Rancho Dr., N. Las Vegas, Tel: 631-7000. Inexpensive as far as buffets go. $5, $7 and $10 (breakfast, lunch and dinner.) Like I said, the farther away from the strip you are the better it gets. (maybe I should blow town altogether). The food is not bad for the price. Numerous varieties of buffets are offered on different days. Flavors 3475 Las Vegas Bl. S. 702 369 5000. 200 Fremont St., Tel:385-3232, buffet 385-6226. Again, the value is in the pricing.. Specialty buffet nights will cost you more. It is really pretty good for the price. I had dinner again here the other night and found it to be very good for the price. $The food isn't much but the price is right. I have been to that place numerous times and I always look at it as a quick fix and not a dining experience. There are several active cooking stations such as American, Oriental, Italian etc. I found the decor excellent, the food about average, the room very comfortable. The value isn't as good as in some other places. 3535 S.Las Vegas Bl., Tel: 731-3311. I like their car collection a whole lot better than their buffet. Especially Adolf's car and authentic(?) cap. They have buffets too numerous to mention because of time and space. $6.00, $8.00 and $9.00 is all you need to remember. Don't forget those cars now you hear! It is closed at the moment. The hotel is being rebranded. 3900 las Vegas Bl. S. 877386 4658. More is the name of this buffet. 7- 10 daily. They advertise an amazing special. $35 for TWO buffets, the other is at the Excalibur. I always found their food a little shakey (at both places), but for the price I would do it.20+ call 702 262 4720. "M", 12300 S Las Vegas Blvd, Henderson, NV 89044 (702) 797-1000. Studio "B"
Breakfast Mon. - Fri. 8:00am-10:30am $10.99 Children 5 years – 8 years $7.99 Lunch Mon. - Fri. 10:30am - 2:30pm $15.99 Children 5 years – 8 years $11.99 Dinner Mon. - Thur. 2:30pm-9:00pm $23.99 Children 5 years – 8 years $17.99 Breakfast Sat. - Sun. 8:00am - 10:00am $10.99 Children 5 years – 8 years $7.99 Seafood Buffet Sat. - Sun. 11:00am - 9:00pm $39.99 Children 5 years - 8 years $26.99 Seafood Dinner Fri. 2:30pm - 9:00pm $39.99 Children 5 years – 8 years $26.99. The prices are high, but not for what you get. The food is really good and all beverages, including beer and wine, are included. 7AM - 9:45PM, Brunch Sat. - Sun. 7AM - 2:30PM. MGM Grand Buffet. Breakfast 7 - 10, Brunch 10 - 2:30, Sat - Sun. 7 - 2:30. Dinner 4:30 -9:30 daily. 3770 Las Vegas Bl. S. 888 529 4828. 5255 Boulder Highway., Tel: 458-8810. If you think this is really a palace you are in for a shock. The food is barely edible. No breakfast except SAT-SUN ..
2411 W. Sahara, at the off-ramp and on-ramp of I-15. 03/02/01. This place is slipping. I had much better food here before. The other Station Casinos have much better food too. But, the price is right, especially if you have one of their boarding cards. B.T.W a boarding card is their bonus card and is available at any Station courtesy desk. Just recently tested it again. The quality is much lower now. Best to avoid unless you have one of their half-off coupons. I keep on checking but things are not getting any better. I play bingo at that hotel so I have lots of opportunity to look around. The other day there was not a single hot vegetable on the menu. Unless I classify a potato as a vegetable. Watch for the County Health Dept. ratings! They get written up often. West Flamingo Road, just a few blocks west of the Strip. Across the street from the Gold Coast. Festival Market buffet. We had our Thanksgiving dinner there. In view of the fact the hotel had only been open a week I am not giving an evaluation at this time. I do not think it would be fair. Let's give them a chance to get situated. Spice Market, 3667 Las Vegs Bl. S .868 919 7472.
call for hours 702 785 5555. 3655 Las Vegas Bl. S. Tel: 702-946-7000. In exchange for about $25 in US currency you can get some phoney baloney French decor to go with the mostly phoney baloney French food.You would think for that kind of money they could get closer to the real thing. "Especialment" in the dessert, salad and cheese departments. I would go elsewhere, spend half the money and get a better buffet. Unless you have never been on the Continent and are eager for the so called "French" experience. I base my above no rating on the price-reward ratio. 7AM - 10PM daily. Lunch Mon. - Fri, Brunch Sat. - Sun. Call for pricing. 702 946 7000. I would stay away from that place. First of all it is about 35-40 miles south of Las Vegas. Also the food there is really poor. The same holds true for the two places in Jean, Nevada Landing etc. Don't eat there unless you are really down to you last couple of bucks. R.R. is part of the Station Casinos chain of gaming places. This one is about 12 - 15 miles west of the strip, well worth a visit. Breakfast Mon - Sat 8:00AM - 10:45AM $6.99* Lunch Mon - Sat 11:00AM - 3:00PM $8.99* Dinner Sun - Fri 4:00PM - 9:00PM $13.99* Dinner Saturdays 4:00PM - 9:00PM $16.99* Brunch Sunday 8:00AM - 3:00PM $13.99* Children under 2 free *With Boarding Pass Card. The only all seafood all the time buffet in Las Vegas. This hotel is off stripo but still pretty close.702-777-7943. I could actually repeat word for word what I said about the Sahara buffet. Do not try it unless you want cheap and inferior. Sun-Thu 11am-11pm Fri & Sat 11am-1am. Lunch Mon-Fri 11am-3pm Brunch Sat & Sun 10am-3pm Dinner Daily 3pm-10pm. (702) 777-7757. Is relatively inexpensive. In exchange for that you get poor quality and minimal service. Actually no service. I would not go there unless price were my primary objective. This hotel is closed at the moment. Should reopen this year (2014). It has now reopened under the monicker "SLS"
with a real good Mediterranean restaurant. If your heart is set to dine at a place on Boulder Highway I would go directly to Sam's Town where the food is much superior to anything else around in that area.. Anyway, here the prices are as follows: breakfast $5., lunch $7., dinner $11. Revisited the buffet and found the quality and selection much superior compared to my previous visit. It is in a new and really nice room. Easy food access from all areas. The only issue I have is with the dessert selection. Other than that I now rate this buffet superior to other buffets in that part of town.. It is really a good concept, the buffet menu changes with the seasons.The pricing reflects their desire to cater to the less discerning. They offer a multitude of different buffets all with different pricing. Too complicated for me. I'll just give you the basics and you can call them for more info. Actually why would you? Try another buffet instead. I tried it and I found it wanting. I had lunch there the other day. Paid about $7. The brisket was excellent. The vegetables on the other hand left a lot to be desired. Not much flavor. It is not hard to put flavor into veggies. Also the spanish rice was downright lousy. But, for the money it (the buffet) is probably OK. Here is a buffet that competes with local hotel buffets for the local trade. Successfully too! Lots of fresh vegetables as you enter. This is an old trick employed by buffet managers all over the world. Load up on veggies and starches and you will not eat as many of the expensive items that are hidden around the corner on your left as you leave the salad bar. Overall not a bad deal. I think I paid about six bucks but I could be wrong. I tossed the receipt. At any rate, you could drop by when in the area. Beats parking and walking at one of those huge hotels. Here you can park almost next to the entrance. This hotel is at North Rancho Dr. in North Las Vegas. Buffet with multiple live action cooking statios: Mexican, American, Italian, Chinese, salsa station. Watch for the Health Dept. reports on this one. This is a darn good buffet, almost always fast seating. These are the same folks who run the Gold Coast. How can it be those two places are so different? The Buffet at Treasure Island, 3300 Las Vegas Bl. S. 702 894 7111. Breakfast, Lunch, Brunch and Dinner. Call for hours. I have eaten there once and I haven't been back. Breakfast $6, lunch $7, dinner $8. Besides, this place is 35 miles south of Las Vegas. Why do I even bother? The same goes for the place across the street, Buffalo Bills. Wicked Spoon, 2708 Las Vegas Bl. S. 702 698 7000. I have eaten there. Good but pricey, and hard to find. I have been to that buffet several times in fact. I did not realize it was called what it is called.